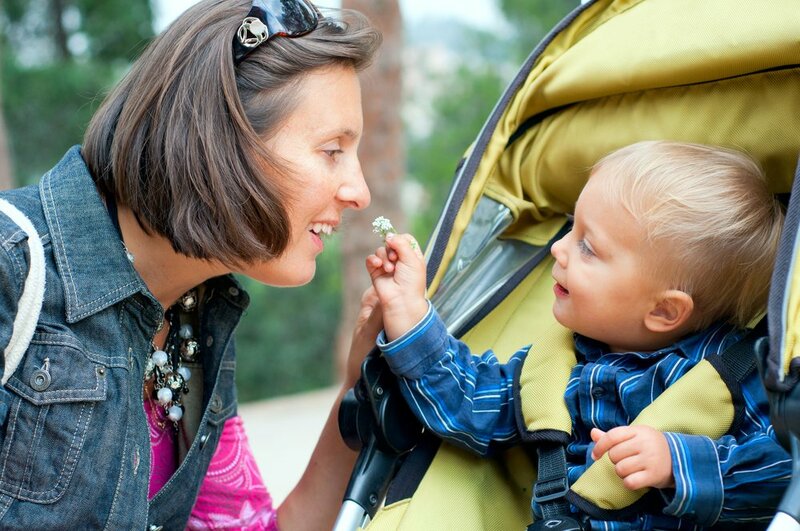 Your two-year-old’s language development is blooming. He now probably has an active vocabulary of approximately 50 or more words, and understands most of what you say to him. This is called receptive language or the ability to understand the meaning behind words. Specifically, at this age most children understand between 200 and 300 words, adding as much as 10 new words a day. By the time he turns three, your little one will probably understand around 900 words. These will include adjectives, common verbs, and prepositions like over and under. Children’s receptive language develops when they gain information from their environment (like their routine, visual cues, sounds, spoken words, written words, and more). They are constantly absorbing and learning. The building blocks for receptive language are attention and concentration, communicating through gestures, social, and play skills (engagement in self-motivated activities). Be face-to-face and make eye-contact with your child before giving him an instruction, making sure you have his attention. When talking to your little one, use words just a little bit more advanced than his expressive language or the words he normally uses. Use body language and facial expressions as visual aids to help your little one comprehend what you’re trying to say. Reduce distractions by turning off any background noise when you are talking, like the television or music. Encourage your little one to ask for you to clarify or repeat what you said if he doesn’t understand it at first. NOTE: Now you know that your little one understands most of what you say! So, it’s a good idea to keep this in mind when you are talking about him when he is around.